Whether you’re a Halo, Metroid, or Dead Space fan, you would all have to agree that none these would have happened without Aliens (or at least not the same). It’s dark and lonely environment evoked a feeling of helplessness, loneliness, and despair. It’s what really started the sci-fi horror trend and paved the way for future IPs to build upon. Metroid Prime 2 descend scene was pretty much a carbon from the marines decend on LV-426. The pulse riffle’s iconic ammo counter can be found on Master Chief’s riffle. Dead Space necromorphs were the Aliens with an Event Horizon twist. So yea, Aliens made a big impact to the videogame market. Yet, surprisingly, there hasn’t been a proper Alien game. The first 2 AVP games were good but it was kinda a bit messy. I wanted a REAL Alien game, one that put me in the shoes of the marine as I struggle to survive the empty hallways—you know, like the movies. All of that seemed like a dream until Gearbox emerged with Aliens: Colonial Marines. Needless to say, I was extatic to play it. So when I heard Games 12 will be having a dedicated booth my fingers began to tingle. Due to restrictions, I wasn’t able to take pictures or videos of my impressions so I would have to stick to ye old writing for you gamers to know what went down (or should I say up). The game mode was a pretty straight forward 4v4 Team Deathmatch–except different. It was a Marines vs Alien match which means each team will have to follow a different strategy as opposed to most Team Death match games of Humans vs Humans. The Aliens have to spread out to confuse the Marines while the Marines themselves had to sticking together by cooperating and surviving. This put more emphasis on working together as a team rather than just getting kills. For example, in my first play session my Marine team members were running around the map and pretending it was Call of Duty. We ended up getting slaughtered and losing by a huge margin. In my next play sessions I invited Dooms and BrokenMirrors to help me out. We worked as a team, stuck together and aided anyone who got jumped by an Alien. We had to rely on our scanner to detect enemies nearby which made things tense by tempting us to swap to a weapon the moment it blinked red. The game didn’t have full regen health either so sticking together and aiding one another was necessary to win. By the end of it we won and that victory felt refreshing and new. It was the kind of CO-OP rarely seen in today’s MP games which rather rewarding the player, rewarded the team. Speaking of rewards, we did end up getting this cool swag for beating the Alien team. We weren’t allowed to play as the Aliens themselves which was very disappointing. From what I could see the Aliens were controlled from a 3rd person perspective and had different classes. You do NOT want to run into this guy. The version I played was on the PC so I instantly chose keyboard and mouse option which for some odd reason had a weird layout. Space was running, jump was a mystery key, and I had no idea what was secondary fire. I thought someone played around with the keys so I decided to switch to default in the option menu but no dice. The keyboard layout was still messy and confusing. Luckily, an Xbox 360 gamepad was plugged in so I just swapped over and the game instantly recognized it. The movement and button layout wasn’t so bad. The LB button quickly pulled out the scanner while RB button shot secondary fire with other keys placed in their default FPS location. One thing I really liked and I know I’m going to sound quirky for saying this, is the rumble. I don’t know if it was the gamepad I was using or just me switching from keyboard, but that feeling really kicked in especially when using the smart gun. I image the Wii U getting the best benefit out of Colonial Marines by adding the scanner to the Wii U pad. While it will make it easier to look at the scanner, I honestly imagine it might kill the fun and suspense of making yourself vulnerable to check your surroundings. The graphics and presentation really felt like Aliens. The dark alleys with the sparking neon lights gave you that haunting feeling that something was about to creep up on you. The gusty wind, multiple lightning strikes with the Space Jockey ship in the background made me feel I was on LV-426. At one point I actually jumped when an Alien attacked me as soon as lightning struck. I’m not sure if this was intentionally programmed or really well timed but whatever it was it did the trick. 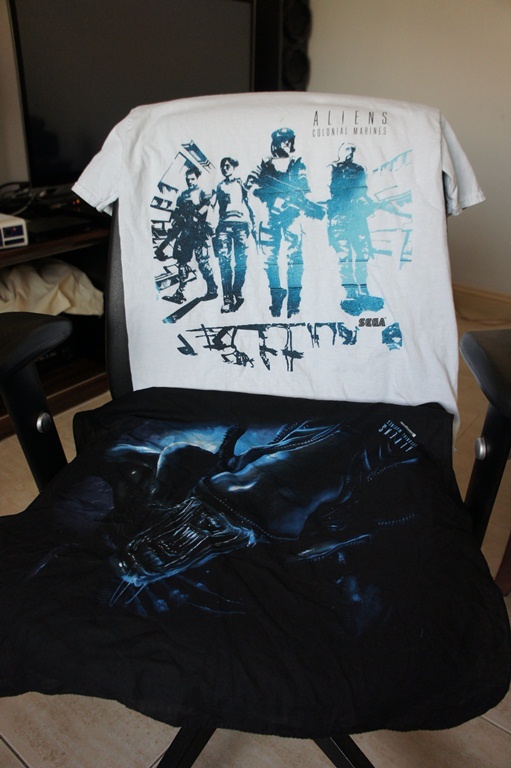 Even though I only experienced the multiplayer, in the end I really had a blast with Aliens Colonial Marines. It’s CO-OP/Team Death Match mix seems like something I get really get into with my buddies. I just wish I could have tried more of it. 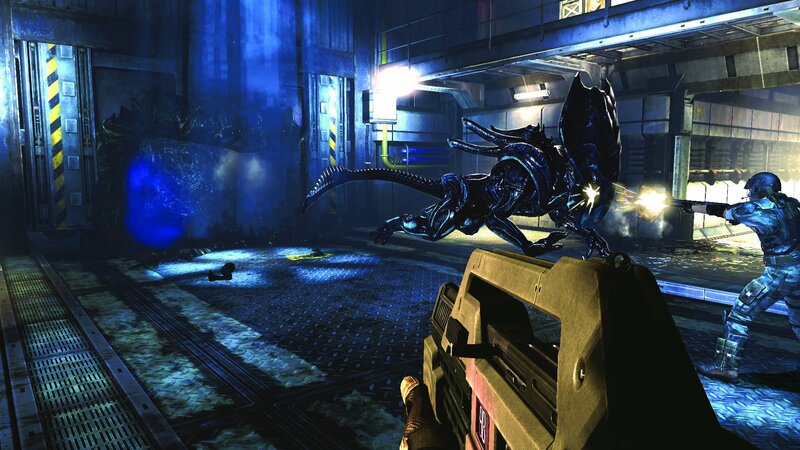 Aliens Colonial Marines is expected to ship on February 13, 2013 for PC, Xbox 360, PS3, Wii U.